Conference Championship Weekend! Let's take a look at the highlights from each meet. The Edward Little Eddies swept the team titles in Class A at the KVAC Championships on Saturday. Standout sprinter Fabrice Mpoyo had himself a day for the Eddies on the boys' side, as he won the 100 meters (11.48) and 200 meters (23.36). He also ran a leg on Edward Little's 4x400 meter relay (3:34.77), which won, as well as anchoring the 4x100 relay, which finished third (45.62). His time in the 200 is a personal-best for the senior. Mt. Ararat's Lisandro Berry-Gaviria accomplished the distance triple, winning the 800, 1600 and 3200. He was challenged by Edward Little's Russell Allen in the 800, but ultimately came out victorious, running 2:03.12 to Allen's 2:04.46. Berry-Gaviria then faced a tough challenge in the 1600 in Oxford Hills' Dominic Sclafani, but the sophomore battled to win in 4:27.44. Sclafani was a step behind in 4:27.86, which is a personal-best for the senior. Berry-Gaviria was able to win comfortably in the 3200, running 9:44.02 to win by more than 10 seconds. Sclafani was second in PB of 9:55.83. Berry-Gaviria's teammate, Tyler Bernier, took the conference title in the 400 meters, running a personal-best of 51.74 seconds, which marked the second time he's gone under 52 seconds this season. Brunswick sophomore Samuel Cenescar won the high jump, clearing a personal-best of 6 feet, 4 inches. He's now cleared six feet or above four times this season. Other standout winners included Dawson Stevens of Oxford Hills in the javelin (176-01), Alex Thompson of Edward Little in the pole vault (13-00) and Connor Jackson of Edward Little in the 300 hurdles (42.24). On the girls' side, Lindy Hyndman and Jillian Richardson each picked up a pair of victories for the Eddies. Hyndman won the 100 meters (12.96) and 200 (26.94), and also finished fourth in the triple jump (31-02.5). She set PBs in the 200 and triple jump. Richardson was dominant in winning both the 1600 and 3200. She ran 5:24.84, winning by nearly 12 seconds, then ran 11:53.03 to win by almost 30 seconds. Her time in the 1600 is a PB. Other standout winners included Jadah Adams of Oxford Hills in the javelin (122-01), Ella Boucher of Edward Little in the long jump (16-00.50), and Leah Savage of Skowhegan in the high jump (5-00) and triple jump (33-00.50). In Class B, it was the Lincoln Academy boys' and the Cony girls' taking the team titles. Sam Russ had a strong day for the Eagles, as he won both the 1600 (4:40.95) and the 3200 (10:21.07). Winslow's Max Spaulding had a big day, as he won the 110 hurdles (16.22), 200 meters (23.37), 300 meter hurdles (41.95) and 400 meters (50.90). His teammate, Jake Warn, stood out as well, as he took conference titles in the triple jump (43-01.5) and 100 meters (11.56), and finished second in the 200 (23.43). The girls' 1600 produced the most thrilling finish, with Winslow's Olivia Tiner edging Mt. Blue's Kahryn Cullenberg, 5:30.45 to 5:30.65. It was Thornton Academy sweeping the team titles at the Southwestern Championships in Saco on Saturday. Leading the way for the Trojans on the girls' side was senior standout Mia Taranko. Taranko showed off her versatility, as she won the conference title in the long jump (16-04.25 feet), finished third in the triple jump (35-05.50), and sixth in the 100 meters (13.13). She also anchored Thornton's winning 4x100 meter relay team, which won in a state-leading time of 50.09. 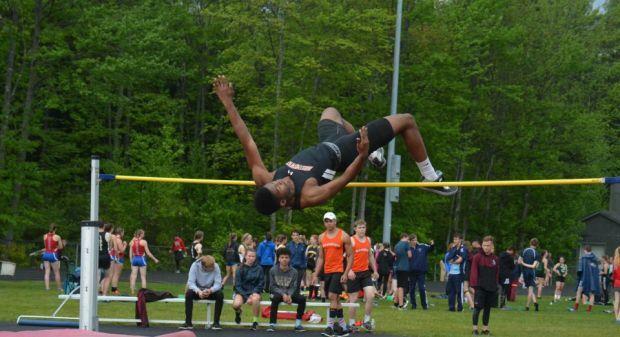 Westbrook's Nyagoa Bayak won the high jump, jumping a personal-best of 5-10.25 feet to break the all-time state best. The mark currently sits as the ninth-best in the country. Cheverus freshman Victoria Bossong won both the 100 meters and 200 meters, running 12.64 and 25.64 respectively. Both times are PBs. Her teammate, Emma Gallant, took the 400 meters in 58.45 seconds. It was the first time this season Gallant has gone under 60 seconds. Caitlin Wolff of Kennebunk and Katherine Page of Marshwood followed in 59.67 and 59.82, respectively. All of the distance races on the girls' side were very competitive, but no race produced the thrill like the 800 did. Falmouth's Malaika Pasch won the event in 2:19.50 to edge Anna Folley of South Portland, who finished in 2:19.88. The time for Folley is a PB, and marked the first time she's gone under 2:20. Pasch also competed in the 1600, finishing second in 5:13.68 to Anna Slager of Gorham, who won in 5:10.47. Other standout winners included Ami Beaumier of Bonny Eagle in the 3200 (11:29.31), Emily Labbe of Scarborough in the 100 meter hurdles (15.11), Annah Rossvall of Deering in the 300 hurdles (46.20), and Emma White of Cheverus in the triple jump (35-11). Leading the way for the Trojans on the boys' side were Jason Montano and Travis Snyder. 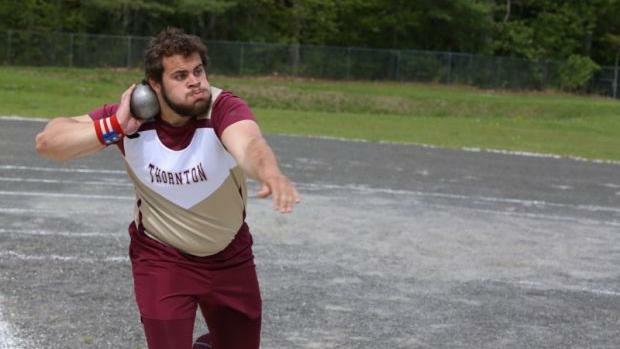 Montano won the discus in a PB of 169 feet, and also the shot put, throwing 55-07 feet. Snyder won the 110 meter hurdles (15.32), 300 meter hurdles (in a PB of 41.45) and pole vault (15-03), and finished third in the long jump (20-09). Jarett Flaker of Scarborough made history in the 100 meters, as he took the conference title running 10.83 seconds. The time is a conference record, and the second-fastest in state history. In the other sprinting events, standout freshman Alvaro Fuentes of Falmouth won the 200 meters, running a fantastic time of 22.67 seconds. Fellow Yachtsmen Douglas Cooke took the 400 meters in a PB of 50.82, with Cheverus sophomore Sean Tompkins right behind in 50.83. Travis Snyder of Thornton Academy won the 110 meter hurdles 15.32, with Westbrook's Dominic Creenan right there in second in 15.34. Snyder also picked up a win the pole vault, clearing 15-03, and finished third in the long jump, jumping 20-09. Falmouth picked up another win in the 1600, with Jon Auer winning in 4:25.74. The 800 had the be the most exciting race of the day, with the top three finishers separated by .26 seconds. Massabesic senior Jarrod Hooper took the title in a PB of 2:02.70, with sophomore Dawson Desrosiers right behind in 2:02.77 (also a PB). Wilkins Rossignol of Gorham was third in 2:02.96 (PB). There was another close result in the 3200, as Deering's Alec Troxell won in 10:04.38 with Bonny Eagle's Aiden Willey a step behind in 10:04.94 (PB). Falmouth's Connor Piers wasn't too far behind in third, running 10:05.52. 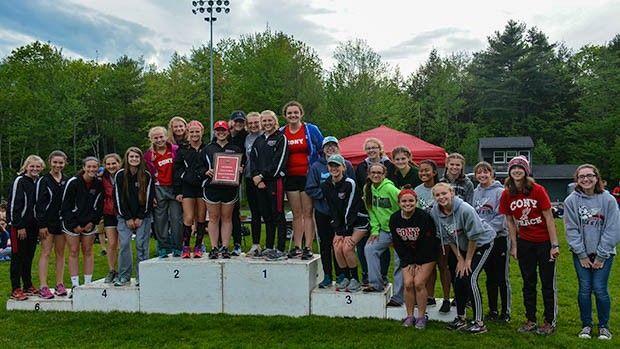 At the WMC Championships at Lake Region High School in Naples on Saturday, it was the York boys' and girls' taking the 2ivision 1 title, while in division 2 the Poland girls' and Sacopee Valey boys' taking home the hardware. As they've done all season, Zach Westman, Jake Martin and Jon Rodrigues picked up a good chunk of points for the Wildcats. Westman won the long jump (20-05), triple jump (42-02.50) and the 300 meter hurdles (39.71). Martin took conference titles in the 110 meter hurdles (15.03) and discus (118-09), and finished second in the high jump (5-10) and third in the long jump (20-02). The 3200 had to be the most compelling race of the day, as Luke Marsanskis of Greely took the win in 10:18.20 with Jack Bassett of Cape right behind in 10:18.22. Freeport's Martin Horne was close behind in 10:20.48. Yarmouth's Luke Laverdiere won the 1600 in a fine time of 4:24. In the 800, it was Mitch Libby taking the conference title, running 1:57.51. He was challenged by Traip's Dalan Hubbard, who was second in 1:59.62. Cape's Matt Concannon won the 200 in the PB of 22.92, and finished second in the 100, running 11.41 seconds. Andrew Peterson of Gray-New Gloucester won the event in 11.37. Darcy Cochran of Cape Elizabeth had a big day on the girls' side, as she took conference titles in the 200 (26.64), 100 meter hurdles (15.27) and the 300 meter hurdles (45.12). Her time in the 300 meter hurdles is a state-leading time. Lily Horne of Freeport took the 1600 in a PB of 5:13.52, then finished third in the 3200 running 11:49.85. Carolyn Todd and Marin Provencher of Greely took the first two spots, running 11:41.66 and 11:48.99 respectively. The Lisbon boys' and the Monmouth Academy girls' took the team titles at the MVC Championships at Lisbon High School on Thursday. David Schlotterbeck had himself a big day for Lisbon, as he won both the 1600 (4:53.36) and 3200 (10:36.21). Matthew Albert from Hall-Dale impressed as well, as he won the long jump (20-02.75) and javelin (155-08), and finished fourth in the high jump (5-10). Jay Hasch of Boothbay won the high jump, clearing 6 feet, 4 inches -- a PB. The Monmouth girls' swept the top seven spots in the 3200 to score 34 points. Brewer swept the team titles at the PVC Large School Championships on their home track on Friday. Surprsingly, the boys' team only had two event winners -- Jacob McCluskey, who won both the javelin (156-08) and the discus (160-04) while teammate Garrett Graham took the shot put (55-10 1/2). Hermon High School was second overall, and they had an exceptional performance from Zachary Beaton. Beaton won the 110 meter hurdles in a conference record time of 15.07 seconds (he ran 14.84 in the prelims), won the 300 meter hurdles (41.61), the high jump (6-00), and triple jump (42-06.50), accumulating 40 of Hermon's 99 points. Hermon also got a great contribution from James Petersen, who won the 200 (22.60, conference record) and the 400 (50.43). Wyatt Lord of Hampden Academy accomplished the distance triple, winning the 800 (2:03.25), 1600 (4:38.04) and 3200 (10:28.05). His teammate, Grahme Sokoloski, was right behind him in the 800 and 3200, running 2:03.85 and 10:28.35 respectively. 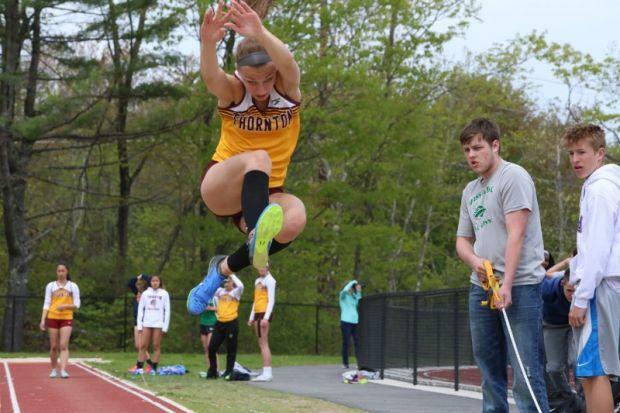 On the girls' side, Ashley Tanguay in the javelin (99-02) and Sophia Inman in the high jump (5-00) were the only event winners for Brewer, which need all of their 142 points to fend off Hampden Academy, who was the runner-up with 136 points. The Broncos had a great performance from Helen Shearer, who won the 800 (2:26.10), 1600 (5:37.87) and 3200 (11:38.66). Standout sprinter, Ashley Anderson of MDI won the 100 (12.49) and 200 (25.95). Other standout winners included Oliviah Damboise of Old Town in the long jump (17-00), the triple jump (36-06.50) and pole vault (9-06). At the PVC Small School Championships at Caribou High School on Saturday, the Orono girls' and the Caribou boys' tool the team titles. Leading the way for Orono was Camille Kohtala, who won the 200 meters (27.62), 400 meters (1:01.30) and long jump (16-03.5). The Caribou boys' had several event winners. Evan Desmond won both the 1600 (4:36.67) and 1600 meter race walk (8:42.82). Evan Michaud won the pole vault (12-06) and Cory Jandreau won the 400 (53.21). Cayden Spencer-Thompson of Mattanawcook Academy won the long jump (23-00.75) and triple jump (47-01.50). His mark in the long jump is less than three inches off his PB.